Please note that Breeke tops have a little thicker fabric and taper in the middle so if you want a looser fitting top then you will want to go up one size in this collection. -- The classic and famous works of art from Van Gogh, Monet, Lautrec, Degas, Klimt, Botticelli and Norman Rockwell are transformed into contemporary woman's fashion clothing styled in 3/4, full length and short sleeves as well as tank tops, artfully printed onto a cotton poly blend. Breeke & Company garments are designed to provide a beautiful blend of colors along with a maximum sense of style, feel and comfort. 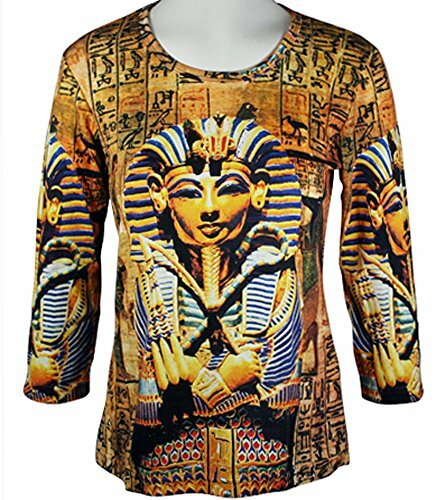 These world renowned artist designed fashion tops are hand silk-screened creating an individualized garment where no two are exactly alike. Additionally many of the tops have limited patterns that will be retired after the initial run similar to an expensive piece of art. The term wearable art or fashion for art really does have some meaning. The artists and prints used in this collection have been known worldwide for their unique, colorful and masterful style of art all of which can be seen as well as worn on these beautiful women's fashion tops. If you have any questions about this product by Breeke & Company, contact us by completing and submitting the form below. If you are looking for a specif part number, please include it with your message.